Glasgow has been named the UK's most vegan friendly city by PETA. This both pleases and surprises me. I don't eat animal products (though I don't call myself a true vegan, as I do use animal products. It's just too hard to give up cashmere) and live in Glasgow, so I have first hand experience of Glasgow's vegan friendliness. It's pretty good, though I would have assumed there were other cities around that were better. I would love to see living without meat or diary, or even experimenting with meat/diary free dining become more mainstream. That being said, there are plenty of places I can get a good meal out, or buy supplies for meals at home. Not a vegan restaurant, but boasts plenty of vegan options on their menu. And their twice fried, rosemary and sea salt chips are worth a visit on their own. I usually eat their veggie burger, but they have vegan sandwiches and tapas style small plates as well. And the staff are very nice. Left Bank has two sister restaurants - The Two Figs and The Bungo. Three restaurants owned by the people formerly behind the 13th Note (also still a vegan place). As the names suggest, music is central to these places, and they have great live music several days a week. Mono has a pub-style menu and boasts home brewed lemonade and ginger beer. Stereo has the most grown-up menu (which is actually somewhat similar to Saramago's menu - another girl-e favourite) and the mezze platter is not to be missed. The West End's 78 has a smaller menu, but more unique, with quesadillas and a refried bean & coconut chilli as stand-outs. The cafe at the CCA, a contemporary art and performance centre, is now fully vegan. With a menu that should please everyone, with paella, pizza, and delicious sandwiches, it's a great place to meet up with friends. The small plates are also great. You'll find very inexpensive South Indian takeaway at Banana Leaf. They have dishes you won't find in many other places in Glasgow, like medu vadai, idly and upma. So worth checking out. The Mother India family actually run several restaurants - the award winning Mother India, the Wee Curry Shop, Mother India's Cafe and Dining In. These are the places to go if you want healthy Indian food that's fresh and tastes home made. They do use ghee in some of their dishes, so ask your server when you are ordering. More South Indian cooking - with fast and friendly service. Their dosas are the stars of the menu, though they offer a variety of delicious traditional breads. 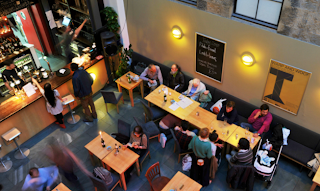 An aladdin's cafe of whole food and vegan options with the friendliest staff in Glasgow. If you can't find what you need, they will offer to order it for you. No website that I can find, but they are located at 123 Douglas Street in the city centre. A bit on the fancy side (it's impossible to spend less than £10 in a visit) but sells organic fruit and veg and groceries you won't be able to find in many other places in Glasgow. They also have a deli with a mix of vegan, vegetarian and meat options. It needs no introduction, I think. My only problem with it is that it's in Giffnock, which is not in walking distance for me (I don't have a car) but I've heard a rumour that a new branch will open in the West End soon. Yeah! A health food shop on Great Western Road, selling vitamins, free-from items, and some vegan groceries. The Holland & Barrett on Sauchiehall Street has a chilled section, so you can buy many different meat substitutes and vegan ice cream.